Fans of this here Web log were not surprised this morning to open up the Sac Bee and read that Sacramento has the highest rate of serious car accidents and drunken-driving crashes of any city in California. Some Sacramentans say the city’s poor ranking makes perfect sense: Drivers here are plain bad. My hunch is that this accounts for most of the problem. However, I can see how the freeway layout and traffic patterns could also be blamed. And we can’t let crystal meth off the hook. What do you all think? not to be an elitist curmudgeon but sometimes the people in sacramento really bother me because they seem so ignorant and plain … dumb. i wonder what the average IQ is here? i’m sure the flight crew was left with the distinct impression that sacramentans are completely unrefined meathead idiots with no understanding of common sense. it was embarrassing, actually. what does this have to do with a high traffic accident/fatality rate? well, i think it is a reflection of the quality and intelligence of people who live here; the rant above is an example of the underlying problem. (don’t worry, i recognize that i could very well be part of the problem with the trigger-happy quick-to-judge attitude. the first step to improvement and healing is self-recognizance.) the prius-driving fool last week who didn’t yield to a police officer responding code 3 to a robbery causing the cop to flip the car? f^%$(^&%!!!!! and then of course this is exacerbated by people like me who walk (or drive) around with this pent up angst … and make things worse. ok thanks for listening, and apologies if i’ve wasted your time. i’m going to go find some valium and go back to lurking now. The simplest answer is probably correct. There are a high number of crappy drivers in this area. I blame the rotten Sacramentans. You know the people who complain about Sacramento offering nothing, yet have no idea where the CSUS Acquatic Center is, have never been to the hang town races, have never been to downtown outside of k st. Yet they only go to the coast or Sierras twice a year. The angry people who are always rushing everywhere. This town is full of rotten angry people. I blame them. I would also like to see how sac county ranks in law suits. I have a feeling we sue like hell too. After all we are entitled to not being disturbed by anyone. Clearly, it is all of the people skirting the hands-free cellphone law by using the speakerphone setting. Maybe it is just density, combined with percieved anonnymity when on the road? Should put everyone’s address on their cars. Would cut down on stupidity if people could stop by your house and yell/shoot at you for crappy driving. My stepmother (who besides this one idea is a complete idiot) had the green paint theory. Basically you pass some type of “good driver” test and you get to be the proud owner of a paintball type gun/spray paint thing of bright green paint. When you encountered bad drivers you could lean out and ‘tag’ them. The paint would be made of some material that could not be painted over or washed off so you were Scarlet Lettered for the life of the vehicle. sac’s highway lanes that mysteriously merge together without signage seem dangerous to me. also, the incredibly dangerous merge of the 99 and 80 east bound cap city freeway seem like the freeway designers just weren’t interested in safety! I’d like to know where the majority of these accidents are happening. a) They don’t think far enough ahead. This not only causes aggravation and accidents, but traffic. Failure to be in the proper lane ahead of time is insane. It’s not the first time you’ve driven home, you know you need to turn right in a few blocks, why are you in the left lane? Del Paso Road is a classic example. 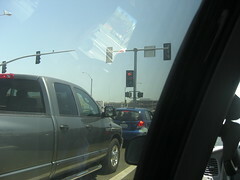 People exit the freeway in the far right exit lane, but they want to go left at the first light, so now instead of changing one lane, they need to cross two lanes. And then they’ll go to the far left of the two left turn lanes when they really want to make the right turn into the Safeway. 2) Sacramento drivers overreact. If somebody swerves nineteen lanes away from you, you don’t need to hit the brakes. In fact, if you go faster, you’ll likely get away from that person. And if you don’t like driving next to the wall in the left lane, move the bleep over, don’t slow to 52 MPH. If someone pulls up to a stop sign, don’t assume they’re going to runit, assume they’re going to stop, don’t slam on your brakes in fear for your life. What with these factors, plus the number of people who just run into buildings around here, it’s no surprise that we have such a high rate. Next Next post: Lodi…On the Water?